Heat your oven to 425° F. Line a cookie sheet with foil. Place 4 shucked ears of fresh corn on the lined cookie sheet. Butter the ears of corn (or you can spray them with a cooking spray like Pam). Place the cookie sheet on the top rack and let it cook for 10 minutes. Turn the ears of corn over and cook for another 10 minutes. (If you choose to use frozen corn your can just throw the corn into the crockpot, don’t worry about roasting it). While the corn is cooking, wash the potatoes and dice them into 1/2 inch cubes. Place them into the slow cooker. Add in the green chiles, taco seasoning, black beans, salsa, cornmeal, chicken broth, salt and pepper. Nestle the chicken breasts into the slow cooker. When the corn is done cooking. Remove it from the oven and use a knife to cut the kernels off the cob (it’ll be hot so use a hot pad or wait until it cools). Add the corn kernels to the slow cooker. 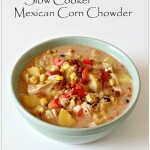 Cover the slow cooker and cook on LOW for about 4 hours. The potatoes should be tender and the chicken should be cooked through. Remove the chicken breasts and shred them with 2 forks or cut them into bite-size pieces. Add the chicken back into the slow cooker. Stir the cream cheese into the slow cooker. Let it melt and stir again until totally melted. Dice the red bell pepper and stir it into the slow cooker. Salt and pepper the soup to taste. Add in fresh lime juice to taste (I added in a couple of tablespoons).